Pretzel Logic's Market Charts and Analysis: Can the DAX Shed Light on the SPX? Can the DAX Shed Light on the SPX? During the 2008 crash, the DAX often seemed to lead the US markets. Since the SPX count may be open to a bit of interpretation, I decided to take a look at the DAX to see if that brought any clarity. The DAX has formed a much cleaner pattern, and looks like it will bounce around a bit (in a fourth wave) for a few sessions, then bottom soon after. My target is 5100 +/-. I have reasonably high confidence in this target, since I arrive at roughly the same number using two different methods of target calculation. 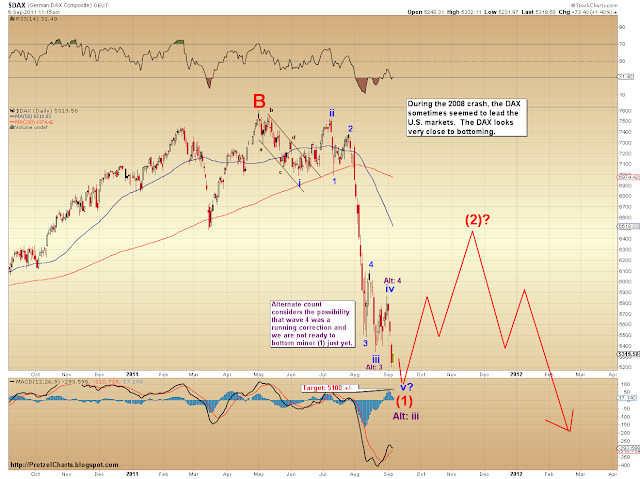 This would argue that my preferred count of the SPX now being in wave (v) of minor 1 is probably the correct count. The alternate count allows for the possibility that wave 4 may have been a running correction, in which case we are only bottoming iii, and will do one more up-down series to complete iv and v.
Bears should be wary of an IT bottom forming soon. The coming minor (2) rally will likely retrace 40-60% of the prior decline. The minor (3) set to unfold after that top will be a fast and furious crash wave.